← Do Natural Treatments Work (on my hives)? Last July, I heard though the grapevine that Stratiolaelaps scimitus, a predatory mite formally known as Hypoaspis, were available locally. These little darlings eat mites, potentially varroa mites. Stratiolaelaps scimitus eat lots of other insects. Technically they are termed a” non-specific predator”, gobbling down 1-5 other bugs every day. In the US nursery trade, they are used to kill thrips. Interestingly they have also been used to control mites on tarantulas, snakes, and hermit crabs. In the US, Canada, and the UK (and possibly other areas) some beekeepers are using repeated applications of these mites to control varroa. Here’s some UK links. There is a downside for their use in beekeeping: Stratiolaelaps scimitus, once placed in a hive, do not stay in the hive. They are ground dwellers. Conceptually, they eat and kill their way though the varroa, while heading for the ground where they will burrow in and reproduce. 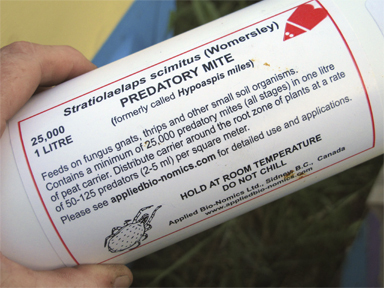 My mites were raised in British Columbia, Canada, by Applied Bio-Nomics Ltd. and distributed by a Bellingham Horticulture company, Sound Horticulture . 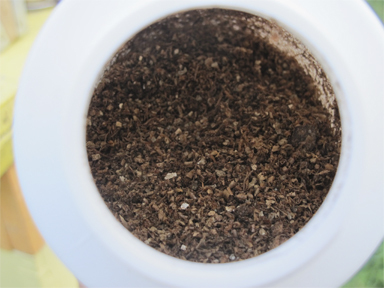 The 25,000 that I got arrived mingled with vermiculite in a one-liter canister. These predatory mites are tiny, smaller than 1 mm in length, which is about 1/25th of an inch. When I received the predatory mites, I was participating in the beeinformed.org bee health survey, which I mentioned in the last post. So every month I had the luxury of having bees from selected hives tested for both varroa and nosema loads. Seemed like a perfect time to test Stratiolaelaps scimitus mites against varroa in my hives. I was not impressed by the mites work. The results were all over the place. I’ll get to the test results in a moment. First I would stress that all the hives already had varroa present. Those having success have noted that they do not work well if the hives have a varroa infestation. I used them in July. Varroa numbers were already high. I wanted to see what they would do if one had varroa. I found a range of suggestions on how many mites to use. Remember these folks are starting with non-infected hives. As you can see, there were a lot of options from which to choose. 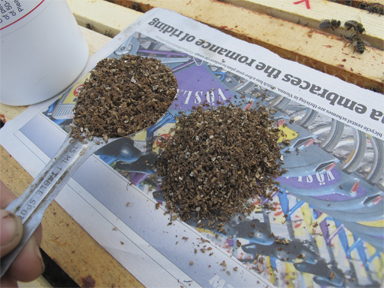 Then I measured the mite/vermiculite mix with tablespoons and teaspoons. The mixture was placed on top of newspaper, as suggested by my supplier. The newspaper was placed on top of the highest brood box. 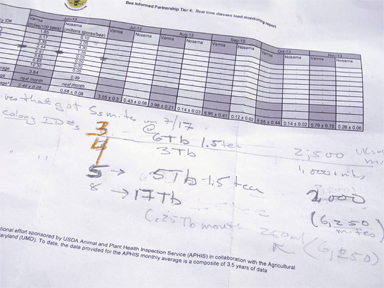 The numbers that precede each result is the number assigned to the hive in the bee health survey. Did the predatory mites work in hive Number 2? I have my doubts, as hive 8 had similar varroa numbers; it got a higher dose of mites yet the varroa count went up, dramatically. If the predatory mites worked in hive Number 6, then they were effective for only one month. OK, I was bummed. I really wanted these little mites, who already live in the US, to be the magic bullet that was going to get rid of the Varroa mites. The only other varroa predator I have heard of would have to be imported to the US, and that is a really, really bad idea : the importation of a non-native animal to kill a pest. That leads to environmental destruction and chaos (as we humans have proved time and time again). They do not take up residence in the hive. 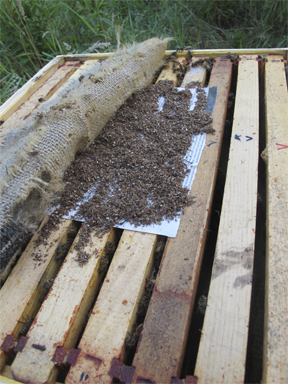 They do not attack varroa inside of capped brood (the real problem area). They don’t seem to work in my hives. ANYONE OUT THERE FIND THEY WORK? If you or a beekeeper you know has used these mites and they worked. Do write and share. As I have often said, every hive is different; every hive location is different. My results show results on only for four hives, with varroa, here a remote corner of northwest Washington state. The hives are fine. I used other natural treatments in the fall. The results of those treatments are in the previous post. 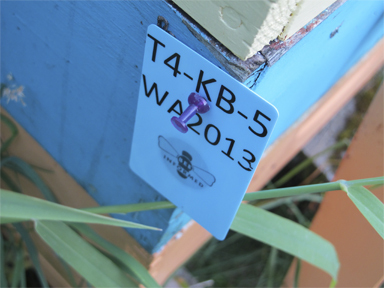 This entry was posted in Beekeeping, Brookfield Farm Bee Yards, Diseases and Pests and tagged bees, Brookfield Farm, Hypoaspis, Maple Falls, Stratiolaelaps scimitus, test, varroa, Washington. Bookmark the permalink.